The issues that almost all large American metropolitan regions and cities are facing are important and messy. Here is a short list: racial segregation, concentration of poverty, poor health and nutrition, poor schools, crime and violence, and disaffection of young people. These problems are important because they hold back the personal lives of millions of Americans living in poverty and degraded urban neighborhoods. And they are messy because they are multi-causal and interconnected. Each problem feeds into another, and it is generally difficult to say what kinds of policy changes and plans would lead to eventual improvement. These are “wicked” problems (link) that require planners to work with complex and unpredictable processes in an effort to improve Cleveland, Chicago, Oakland, Miami, Houston, Kansas City, and Detroit. There is another reason why urban and metropolitan problems are hard to solve — the lack of political will to seriously address the problems in a long-term and sustained way. State legislatures often have an anti-urban bias. Regions often embody conflicts of interest between suburbs and city. Jurisdictions are often more concerned about their own narrow interests than in finding workable regional solutions. And the Federal government often fails for decades to mount serious and realistic urban strategies. So the result is often stasis — nothing happens. One aspect of the challenge is the availability of timely, reliable data about a region’s health and performance. City governments collect a lot of data about health status, land use, and crime; but they are often reluctant to make their information available to researchers and the public. Foundations and individual researchers undertake studies focused on one problem or another; but often the reports are difficult to find and difficult to compare. So we might hypothesize that the situation would be improved if there were an active, well-resourced clearinghouse for regional data from a wide range of sources: census, municipal departments, academic studies, land use surveys, and environmental surveys. Ideally these data sets would be managed by a professional staff who are able to integrate the various sources into a query-based GIS system, and ideally the data sets themselves would be publicly available (subject to appropriate privacy conditions). this kind of regional data warehouse would not directly solve the problems the region faces; but it would give a clear understanding of the scope and distribution of the problems that need to be addressed; it would provide an empirical base for proposed policy solutions; and it would provide a baseline for eventually evaluating the policies that are adopted. Fortunately, there are good examples of exactly this kind of effort underway in various regions around the country. One such effort is underway at the Community Research Institute, part of the Johnson Center for Philanthropy at Grand Valley State University in Michigan (link). The Institute focuses primarily on several counties surrounding Grand Rapids, but it is also preparing to expand its coverage to other parts of Michigan. With a foundational database linking US Census data geographically, the Institute attempts to provide geographically linked data down to the neighborhood level. Here is an example of a map of the teen birth rate in neighborhoods of Grand Rapids (link). The Center has developed a general tool, MAPAS, that can serve as a platform for integrating and presenting a wide range of social data sources (link). A similar effort is underway in the Detroit metropolitan region, under the rubric of Data Driven Detroit (link). D3 is attempting to create this kind of publicly accessible, spatially presented data warehouse for the city and the region, and the early results are promising. 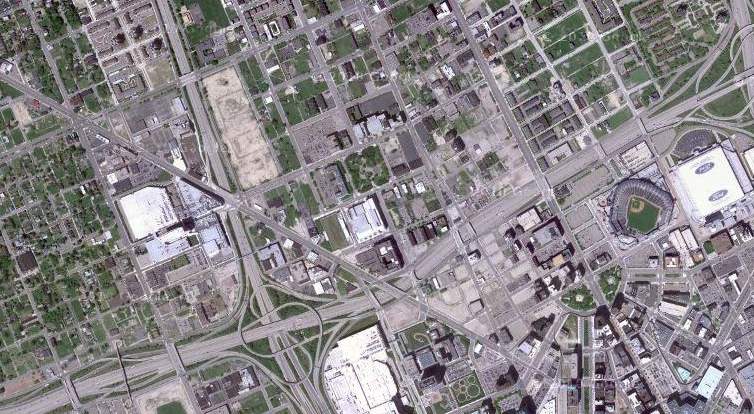 Here is a report on a recent study conducted by D3 on housing stock in Detroit (link). So how can data sources like these be folded into good planning efforts for urban and metropolitan progress? The city of Detroit under the leadership of Mayor Dave Bing is just beginning an important planning effort that ties into the need to adjust the cityscape to the dramatically smaller population it now contains. This effort is called the Detroit Works Project (link), and it is explicitly committed to data-driven decision making and planning. The Integration Initiative builds upon Living Cities’ 20-year history of investing in cities. It acknowledges both the power and limitations of the neighborhood as a lever for change and seeks to drive a broader perspective that recognizes the role systems and regions must play in securing economic opportunity for low-income people. The Integration Initiative will provide at least $80 million in grants, loans and Program-Related Investments (PRIs) to five regions to help them tackle the greatest barriers to opportunity for low-income residents, including education, housing, health care, transit and jobs. Living Cities and its members are making a total investment of $15 million in grants, $15 million in PRIs and $50 million in commercial debt. PRIs are flexible, low-cost loans provided at below-market rates to support charitable activity. In order for a project like this to succeed, it needs to be based on solid empirical data. It is crucial for the progress of metropolitan Detroit, and other cities around the country, that the region succeed in creating a unified regional data source.